Hey there! Thanks for dropping by Tyler48's Blog! Take a look around and grab the RSS feed to stay updated. See you around! There are many different kinds of castles like Mote and Bailey castle. This castle was made out of wood. the design of the castle was the manor house was on the top of a hill that was made very steep so attackers could not climb it. This castle also had a motte around it. Mottes were usually filled with water or sharp sticks at the bottom of it. This is one of the earliest castles. Stone keep castle. This castle replaced the mote and baily castle because this castle had better protection It was surrounded by a wall that didn’t have very many windows. at first the walls were rectangles but after a while the corners on a rectangles were easy to break through so they made the walls circular. this castle also often had a mote filled with sharp sticks or water. 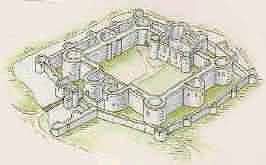 Concentric castle was the best castle for defending because there was two sets of walls a smaller wall on the out side and a bigger wall on the inside then the actual castle. Between the two walls was usually a mote with sharp sticks or water. The reason the bigger wall was behind the small wall so archers could fire over them. The archers on walls were also very well protected there was little windows so archers could shoot out at the enemy and the enemy cant shoot back. There are many rooms in a castle the most common one is the Great hall. The great hall was where all the nobles the lord and loyalty had there meetings, dinners, etc. In every castle there was a dungeon the dungeon was used for when the kings knights captured some one they would lock them up in the dungeon. All castles need to have a garden,well and a kitchen. They need a well in case they come under siege so they get fresh water and wont die of thirst, They need a garden so they can grow food so they can eat. Then the kitchen to cook the food. The draw bridge on a castle draw bridge was used on a castle gate to cross over the moat and it can be raised when attacked and lowered to get out. This is a big steel gate that could be quickly lower when castle becomes under attack. that blocked the enemy out of the castle. this was used for archers to fire arrows out from the castle. these were located on the top of a wall where archers could fire arrows out safely and not be shot back at. 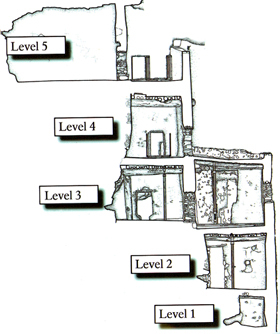 There are about six common ways to attack a castle. The most common way before there was stone castle was fire. They would shoot fire arrows over the walls and burn the building inside. Battering rams were used for breaking enemies walls or knocking the gate down. Belfry and ladders. Ladder were used to climb up the enemies walls. But climbing a ladder was very risky because the ladder was usually pushed over or boiling water was dumped on you. A Belfry was a tower that the enemies pushed up against the wall and once it was there they would open the door so men could get on the wall. Catapults were used to destroy a castle wall or throw fire balls or rocks over the walls. Mining. They used mining to go under the wall and collapse it so they could get in the castle. Siege. 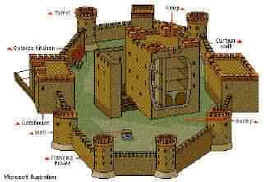 Attackers put castles under siege so know one could enter or leave the castle. The best defense for this was to send all the people who could not fight out so there was more food for the knights. When attackers came up to a castle wall the best defense they had was shooting arrows at them enemy. When the enemy had catapults and belfry There best defense was shooting fire arrows and try to catch them on fire. Enemies would try to climb over the walls of a castle with ladder but the ladder were usually pushed over or they would dumb boiling water on the enemy.